As the hero rides his mini off-roader through the jungle on the lookout for dinosaurs, an agile coelophysis hides behind a bush, ready to pounce. Can our brave hero capture it using his tranquilliser gun before the dino escapes and attacks the city? Includes hero minifigure and coelophysis dinosaur. 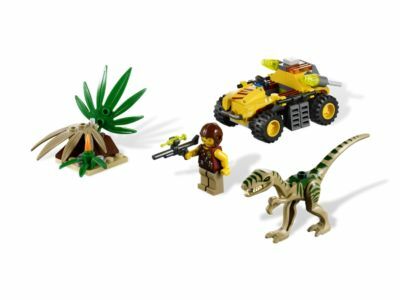 The Coelophysis Ambush (5882) Lego set is no longer directly available from the sites below. However, 3rd party partners of these sites might still have the set available. Alternate description Avoid the ambush and capture the coelophysis!